Yeah, we just got underway with a new semester, so I haven’t had much time to read… and even less to write. However, I did squeeze in an evening of reading, which I devoted to “Forged” by Jennifer Rush. This is closer to a long short story than to a novella, but it is billed as a prequel, so that’s fair, I suppose. Since I haven’t read any of the series, I was a bit baffled by this piece. Dani seems to be quite the victim, but she is being manipulated somehow. The writing is good, but there seemed to be more going on than I was able to understand. The why and the who were a bit ambiguous, and the twist at the end was indeed unexpected. Ultimately, I felt more confused than intrigued, but those were my mixed emotions when I got to the end. Others seem to enjoy the series, so at some point, I may revisit it, but “Forged” was simply not compelling. So… let’s say it is for fans, but not a good intro to the series. Up to Date— a quick review of a quick read. Very light romance is not normally my thing, but a friend suggested that if I would “like” Gemma Halliday on Facebook that I could get a freebie on Friday. So, one of the recent choices was a romance novella called Up to Date, which is also billed as Better Date than Never series, Book #8. When I began Up to Date by Susan Hatler, I was immediately hooked. The main character’s name is Ginger. Her sister is named Mary Ann. And, yes, their dad was a big fan of Gilligan’s Island. The tone of this book kinda goes along with that… a bit romantic and quite a bit of comedy. This version of Ginger is miserable in her job, because being an office manager is a real snoozefest. Her home life lacks stability, because flighty sister Mary Ann never seems to have money to pay rent, but has lots to spend on frivolous social matters. Ginger is artistic and highly interested in home decor, so her true calling is to be an interior decorator. Knowing this, and knowing her talent for it, a friend suggests that Ginger donate her design services as a prize in a charity auction. The winner of the auction is a guy who wanted to date Ginger, but in typical romance fiction style, Ginger doesn’t care for him. Or maybe she does. Anyway, I really enjoyed this light romance and urge those who enjoy the genre to download Up to Date. I read the Kindle version, and it is a most pleasant way to spend an evening. When I was growing up, I loved westerns. There was much to like about them: horses, good guys in white hats, horses, bad guys in black hats, horses, guns, horses, beautiful settings, more horses…. you get the picture, I am sure. My early favorites were “Fury” which was a show about a horse, “My Friend Flicka” which was about a horse, and the Roy Rogers show, which was mostly about the horse named Trigger. At least, that is how I remember it. Then, I grew up and westerns were not in favor in Hollywood anymore. My early love of science fiction is all intertwined with my love of westerns. Once, I was amazed by a very intelligent woman who said she despised Star Wars. I laughed, and said, “It’s just a western!” As she gaped at me, I went on to explain that Star Wars owes much to westerns, from the bar scene (just a saloon) the greenhorn (Luke Skywalker) being guided by an older and wiser mentor, the gunslinger (Han Solo) and the Millennium Falcon, which doesn’t have much on a good horse. Westerns have never been as popular as they were in my youth, but they have grown up. 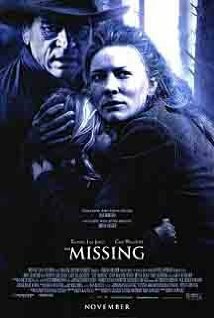 Recently, hubby and I were looking for something on Netflix that we hadn’t seen, and “The Missing” with Tommy Lee Jones and Cate Blanchett caught my eye. The description reminded me of an oldie but goodie, “The Searchers,” so we we popped some corn and got involved in Ron Howard’s take on the quest to foil white slavers in the old west. We enjoyed this suspenseful tale. The film has some fabulous scenery, very wicked bad guys, a very heroic mother (Blanchett) and too much mysticism for my taste. Oh, and there were several horses, but lately, filmmakers seem to think they are like cars or motorcycles, just transportation. This plot could have been told in a science fiction setting, with space ships instead of horses, but it works reasonably well as a western. Check it out on Netflix streaming.